Child's Play Learning center has been one of the best choices we have made for our children. During our working hours I can focus my attention on my career as I know the safety and well being of my children is certainly being taken care of here. Through Child's Play, my children have acquired social skills beyond their years. The center has helped them to understand the importance of sharing and playing well with other children. The teachers here are tremendous and work well with the children on a daily basis. The teachers have not only acquired the trust of us as the parents but also the trust of the children which to me is equally important. I could not imagine sending my children anywhere else. This is the best daycare center in the Pickerington area from the staff, the families and the layout of the facility. I can not thank the center enough for the wonderful and nourishing care they provide our children while we are working. The center where my children were at before Child’s Play was not preparing my oldest son for Kindergarten adequately enough. In only a short time at Child’s Play, I noticed a great improvement in his letter and number recognition, along with sight words. I found his Pre K teacher knew the best way to educate him and was well versed in the Kindergarten requirements. Without Child’s Play, my son would not have been prepared to enter school. I have no concerns that my youngest son, who is in Preschool, won’t be prepared for school as well. Thank you Child’s Play. My daughter is currently in the Pre-K program at Child's Play and she loves it. I cannot say enough good things about this place and all of the teachers and staff I have dealt with over the past 4 years. They have helped in her development every step of the way from the baby stages, through the potty training and toddler days until now. The staff has been so loving and caring and treats her like one of their own children. As a working Mom, to be able to take her to a center that I know she is well cared for, loved, safe, and developing both educationally and socially...well you just can't put a price on that. Thank You Child's Play Learning Center! 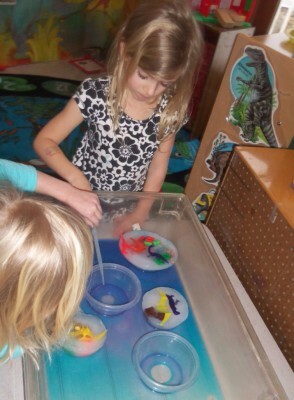 We can't say enough great things about Child's Play Learning Center! Prior to joining Child's Play in 2010, we felt compelled to move our oldest son from four different childcares as we struggled to find the right combination of curriculum, individualization & care. When he entered Child's Play as a preschooler we were immediately impressed with the personalized attention he was given and how quickly he was able to adapt and thrive. Three years and another son later, we are now proud to have two boys who are growing up a part of the Child's Play family. Throughout the center the teachers are dedicated, loving individuals with strong child development skills (who somehow know every child in the center regardless of classroom assignment!) They keep the curriculum fresh (and FUN!) and make sure the parents stay informed on progress and areas of opportunity. The directors are excellent communicators who base all decisions on what is best for the children, while creating a strong sense of community among staff, children & families. There is no bigger responsibility as a parent than to make sure your children are taken care of while you are at work - and we couldn't be more pleased with our decision to go with Child's Play!